Ok, so I’ve been talking about this giveaway for a little bit now. I’m happy to say it’s finally here! I’m introducing a new line of earrings called The Natives. I’m truly smitten with these girls, they are fast becoming my go-to earrings! Versatile, rugged, filled with gorgeous texture and inspired by the southwest. It all began with these. Native in heat treated copper and bronze glass. I wore these almost the whole time I was in North Carolina, picking up compliments along the way (which is always nice, I know you agree with me ;-)) . 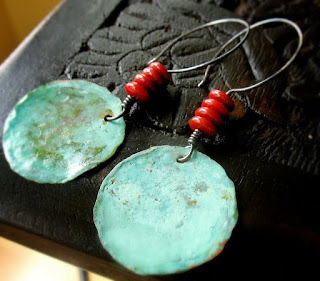 Native in copper with a gorgeous patina of aquamarine and bright red glass. The contrast is downright heady! For the giveaway, the winner will receive their choice of one pair of The Natives! 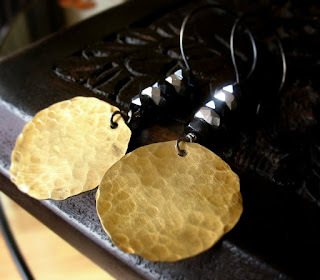 Brass, copper or sterling silver. It’s up to you! All you have to do is leave a comment on this blogpost telling me your favorite place to visit. I’ve mentioned on here several times that I’m a Smoky Mountains girl myself, and I’d love to read about some of your favorite places to go to reenergize! I’ll announce the winner next Friday evening! The Natives make their first appearance in the shop this evening or tomorrow morning~ I hope you love them as much as I do! ***EDIT*** The winner for the giveaway will be chosen by a random number generator. 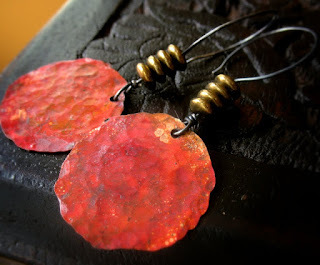 Those are beautiful, you make some awesome jewelry. I love the smokies just like you, but haven't been there since my honeymoon. We like to go up to Golden Gate Canyon and camp or just hang out for the day. It's beautiful up there. This weekend we are going to Scotts Bluff Nebraska... never been there so will have to let you know how it is. Absolutely gorgeous!!!!!! Obviously you had a good time in NC. I love the Smokies as well. My husband and I went there for our anniversary in January. BUT to truly relax me I need an island get away. Anywhere in the Carribean for me!!! and as close to a coral reef as possible. Beautiful jewellry! 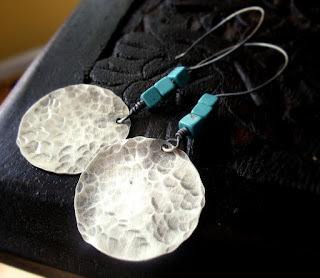 I especially like the silver and turquoise earrings. My favorite place to vacation is going camping in the Rocky Mountains-fresh air,beautiful scenery-its the best! What a generous giveway. 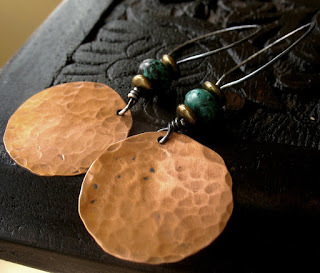 A beautiful set of earrings. I love the colours, but my favourite is the aquamarin tone. Our favourite place is the highlands of Scotland, not just because of the people and scenery but because we got married at a castle there. Have promised our daughter that we will go there one day and she can be a princess! Very nice job on making those!!! they are all truly unique! ... hmmm. I love the beach! what i love most is how its everywhere and not far away. [so easy on the wallet!] ... when i was little i went to the beach all the time w my mom and pop. they would always breathe in the fresh ocean air as if it was their first time experiencing that unique smell. i never appreciated it til i got older. the feel of sand thru your toes, the feel of sand as it runs thru your fingers along w the amazing view and oceanwater... the most relaxing place on earth! These are awesome! 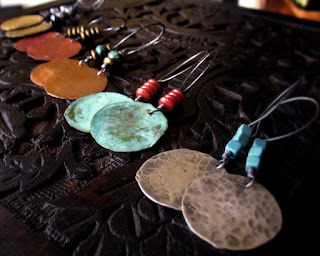 I love mixed metal jewelry. Love the earrings. My favorite place is to be in the country riding my horses... more like Middle TN were there are not mountains.. but beautiful rolling hills ... and quaint country shops to shop in, and wonderful unique places to stopo and eat.. The thought of getting up in a cabin in the woods and drinking myh morning coffe out ont he proch with a nice cool breze is the best to me! Adrienne, your work is awesome! Very beautiful jewelry!!! My favorite place to visit..huummm...well, we just got back from camping by Lake Huron in the "thumb" of Michigan. It was really nice...had a nice beach and the water was actually not frigid so we could enjoy ourselves in it. Prior to that we went hiking in the White Mountains and visited Boston. That was very cool too. I'm not too picky when it comes to travel...but I guess the beach is my ultimate favorite.